Making homemade cards is such a wonderful way to remind someone that they are loved and appreciated! And it is a great source of creative fulfillment! It can also be more complicated and time-consuming than we would like it to be! We would like to introduce you to a system that has made card-making easier and more satisfying then ever! It will help inspire you to make beautiful, elaborate cards in no time without all of the bulk and expense that often goes hand-in-hand with the process. First and foremost…We love paper! Everyone on the Kiwi team is a self-proclaimed paper addict! And what’s not to love? The colors, patterns and textures available in our paper stashes are a treasure trove of creative potential, and it turns out that they are also a big part of the solution to some common frustrations that we share as card-makers. Paper is the perfect way to dress up any card with layer upon layer of color and texture. Using our paper properly will result in cards that look like a million bucks, without actually costing us an arm and a leg! But how to go about tapping into this resource? Well, that’s where our Designer Templates come in! Our Designer Templates were designed to help you take advantage of those scraps of paper that you’ve probably been hanging on to. They are a simple, back-to-basics tool for cutting universally appealing shapes out of your paper that will result in gorgeous cards that take half the time! But that is only one small part of what this product can do for you! Let’s show you what we mean! The first step in the Play-to-Create system is to design our card. Coming up with a design idea that you can be confident about can be the hardest step in the card-making process. Too often we will stare at our materials for hours, trying to will an idea into existence, or we will surf endlessly on the internet trying to find some inspiration. We may even resort to sketching something out on a piece of paper, but the end result is never quite what we imagined it would be. Our Designer Templates allow you to visualize the different design options before you cut into anything, which will free you up to play your way to creativity! What you see is what you will get!Just pull out your card base and a set of our Designer Templates and start moving them around. Mix and match and layer them and watch as new design ideas spring to life! 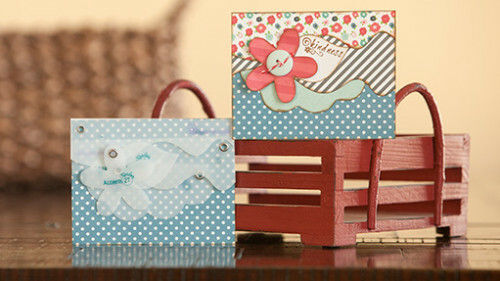 Being inspired as a card-maker has never been so simple. The possibilities are endless! Just have fun! To see this step in action, watch this quick demonstration video. Once you have designed your card in templates, and you’re happy with what you see, simply trace each element onto your coordinating paper and cut it out with a pair of scissors. That’s right! Just a pencil and a pair of scissors. No expensive machines or special tools needed! And don’t worry about cutting a perfect line! A little bit of ink along the edge of each element will hide any blemishes as well as covering up any leftover pencil marks. We also recommend inking your edges as a way to take full advantage of the paper that you’ve chosen to use.Adding ink to each piece will separate the layers of your creation in a way that will highlight the patterns and colors in your paper and add a sense of depth to your card, without making it too bulky. To see a demonstration of this step, as well as some tips on cutting, watch this quick video. Next, simply replace each template on your card with the completed paper element. It is hard to describe the sense of satisfaction that comes as you watch your design spring to life before your eyes! And the best part is that it will look exactly like you thought it would every time, if not better! The end result will be a beautiful, inexpensive card that will fit easily into an envelope and bring an added sense of creative fulfillment to your day! Last, but certainly not least, add a personal note or sentiment and Share your creation with that special someone in your life! They will be sure to feel appreciated, and may just be inspired to create something of their own! Watch this short video to see a quick demonstration of the final step and to see the finished product.